16 year old Julian Tun was killed in San Pedro on Saturday night. Now, Tun was not even an adult - but already he was the one of the most wanted names in the streets - because he was accused of trying to kill a senior George Street figure in a truly brazen execution attempt last year. 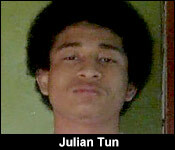 Late on Saturday night, 16 year-old Julian Tun's body lay dead on Seagrape Drive, just south of the Island Town. Someone shot him in the left cheek, the top of the head, and to the abdomen, and within minutes, those injuries caused him to bleed out right there on the street. By the time police responded, there was nothing they could do for him. Islanders tell us that just before the barrage of gunshots, they heard a boat parking nearby, and shortly after the shooting happened, they heard it leave the area. "Initial investigation into this matter is that this said male person went at that location to meet someone. 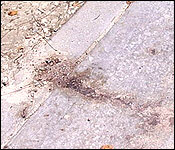 After which he was remove off the compound and then later returned. And then he encountered two male persons and that is when we think that the fatal incident occurred that he was shot." "He was visiting. He has on his record a Tibruce Street address and also a Hope Creek address in Stann Creek District." "These are isolated incident and unfortunately it's happens here on the island. Just like that night before the shooting happened by Banyan Bay. I mean this guy didn't live there, he was just passing by. Unfortunately the hit was done here." "He is not from the island definitely. 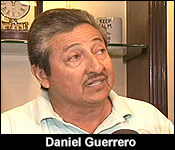 I think he originates from Punta Gorda and he doesn't lives here. So we know that." It is believed that he came to the island early on Saturday, possibly lured to his death under false pretenses by a female. Police aren't sure why he was killed, but he certainly made enemies after attempting the most brazen street execution attempt Belize has ever seen. It happened at the entrance to the Queen Street Police Station in June of 2016. Back in June of last year, we couldn't show you his picture because of the laws protecting him from as an underaged accused. 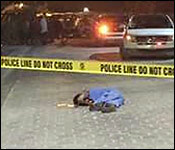 But, Tun was the 15 year-old young man who got into a gunfight with Police Corporal Alrick Arnold. He was arrested on the scene while the weapon he shot the officer with. Eyewitnesses say that this was same gun he fired at Brandon Tillett, when he tried to kill the reputed member of the George Street Gang. His murder on Saturday night is being looked at as a possible retaliation for that failed execution. "That is the allegation that we encountered as well and we are also investigating further to see of that is the issue. That is the only lead that we have, the most concrete lead that we have and we are engaging in investigation geared on finding the persons who have committed this last incident." "Is it believe that this young man was lured here to his death?" "At this time I would not want to speculate on that. Our investigation is ongoing and we are looking at all different leads to try and find who actually committed this crime. We have 9 persons in custody at this time." "You believe that this person was lured here to be killed?" "Based on what I am getting. Again, it's not official because we talk about rumors and I don't want this to go out like that. But based on what I am getting, yes." Julian Tun's family declined comment today. San Pedro Police were initially seeking two persons of interest at the start of investigation. However, on Monday, July 10th, Officer in Charge of the Coastal Executive Superintendent Henry Jemmott told The San Pedro Sun that they have since detained nine persons for questioning in connection to the murder. As of press time, no official charges have been laid against these persons. Tun was no stranger to police, as on June 20, 2016 he was arrested and charged with 4 counts of attempted murder, 2 counts of dangerous harm, 4 counts of use of deadly means of harm, 2 counts of wounding, 1 count of possession of an unlicensed firearm, and possession of unlicensed ammunition. Tun was the main suspect in the attempted murder of Police Corporal Alrick Arnold during a gang shootout in front of the Queen Street Police Station in Belize City. While previous news reports indicated that Tun had been remanded to the Belize Central Prison following his arraignment, the exact date of his release is not yet known. Julian Tun, 16, was gunned down on Saturday night in San Pedro Town and from all accounts, it appeared that he was lured to his death in his search for a sexual encounter. Tun was last seen alive by his family on Saturday morning when he left his home in Hope Creek, Stann Creek District, indicating that he was going to San Pedro to fish for lobster. A review of his social media accounts revealed otherwise. He had travelled to San Pedro to meet a young, attractive Hispanic woman whom he added as a friend on Facebook less than a month ago. That woman, believed to be romantically linked to a prominent George Street associate, told Tun via Facebook messenger that she had secured a room at the Banana Beach Resort so that they could have a night together. A review of his call log revealed that she had also telephoned him just before midnight when he arrived near the resort on Sea Grape Drive and was ambushed by two armed assailants. He was shot as many as seven times in the left cheek, the top of the head, and in his abdomen. He died on the scene. Police have since detained nine persons for questioning, but have not yet charged anyone. Tun’s murder, however, will undoubtedly affect the gang truce brokered in Belize City earlier this year, in April, by ACP Chester Williams. Tun’s mother, Natalie Tun, 47, told our newspaper that she received the news of the death of her youngest of eight children via a phone call. She told Amandala that she simply wants peace. “I want them to leave us alone. They’ve finished their job,” she said. She said that she will miss her son’s smile and the way he provoked her. Additionally, she will miss his hugs and kisses and all the happiness that he gave her. The Tun family awaits the result of a post-mortem examination scheduled for Tuesday before they finalize funeral arrangements. Tun, said to be a recruit of the South Side Gangsters (SSG), rose to notoriety in June of 2016 at age fifteen, when police say he brazenly opened fire in front of the Queen Street Police Station while dressed as a student. His target was reputed George Street boss, Brandon “BT” Tillett, who had gone to sign in at the station as a part of his bail requirements. 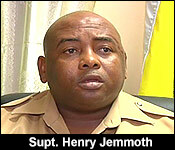 However, Tillett, would escape unharmed, while four persons, including Police Corporal Alrick Arnold, were injured. Tun was later charged for this incident and released on bail. How is it possible that he was out on bail? He tried to assassinate a rival gang member in front of a police station and in the process ended up shooting a cop. Does the concept of "some levels of crime are denied bail" not exist in Belize?